Anyways, but this won’t stop me from baking the “BEST” Chocolate Chip Cookies! I was not 100% sure but I thought I wrote down enough information from watching the show on the back of local grocery sale fryer 🙂 , I decided to bake cookies immediately. Let’s see if this “scientifically proven” recipe really the “Best Chocolate Chip Cookie”?!?!?!? 2. Remove from the heat and add remaining 4 Tsp butter to the skillet and melt them completely. 3. Add ½ Cup Sugar and ¾ Cup Dark Brown Sugar to the melted butter mixture and mix well. 4. Add 1 whole egg and 1 egg York to the butter & sugar mixture and mix well till looks glossy. 5. Add Pure Vanilla Extract to the Wet Mixture (Butter & Sugar & Egg) and mix well. 6. Add Dry Ingredients (Flour and Baking Powder) to the Wet Mixture (Butter & Sugar & Egg) and mix well. 7. Add Choco Chip to the dough mixture and mix well. America’s Test Kitchen did some survey that they came to the conclusion of “Ghiladelli Bitter Sweet Chocolate Chip” is the best for this recipe. 8. Bake 375 degree for 11 to 15 minutes. The Final Product: THE BEST CHOCO CHIP COOKIE!! America’s Test Kitchen was right. 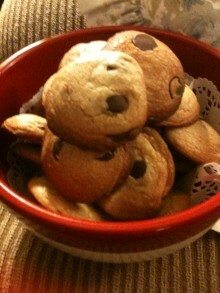 I think this was the BEST Chocolate Chip Cookie I have ever baked. The process of browning butter added the nutty and carmel flavor to the cookie and the bitter sweet chocolate chip added the sharp chocolate flavor to balance out the nutty rich sweet cookie. I’ll try with Semi Sweet Chocolate Chip next to experiment the other flavor combination. Happy Baking & Happy Holiday!